Georgia was one of the first southern states to build a penitentiary to confine criminals. One such penitentiary, the Georgia State Farm Prison, located on route 22 in Milledgeville, GA. 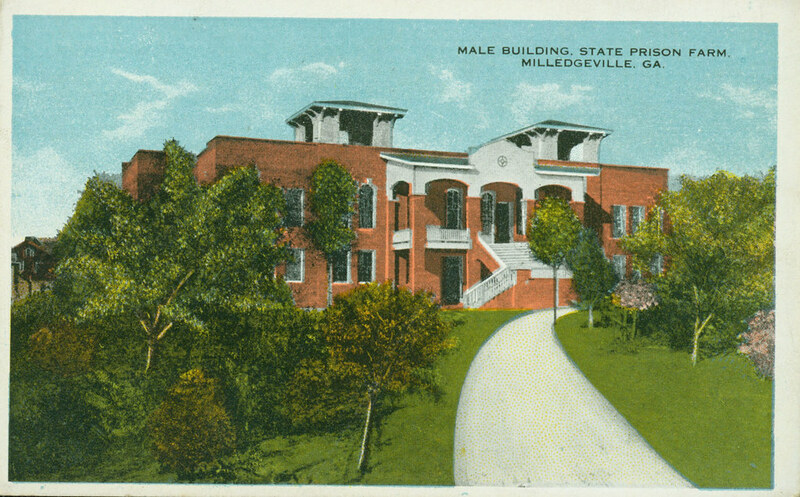 The State Penitentiary was located in Milledgeville on the grounds of what is now Georgia College & State University. The men's' building, housed up to 600 inmates, the women's building had been on the south side of Highway 22 and was torn down in the 1940's. The Old State Prison operated from 1911 until 1937. Included among the inmates was the famous stagecoach and train robber, Bill Miner, who died in the prison in 1913 and was buried in Memory Hill Cemetery, and Leo Frank, who was abducted from the prison in 1915 and later lynched near Marietta after being wrongly convicted of murdering a fourteen-year-old girl. Georgia's first electric chair was in the Old State Farm Prison and was built in 1924 by George Edward Barnes of Milledgeville. The first execution in the chair occurred on September 13, 1924, and was 22-year-old Howard Hinton of DeKalb County. One of the youngest persons executed in Georgia, 16-year-old Eddie Marsh, was put to death February 9, 1932, for the murder of a Dougherty County pecan grower and is buried in an unmarked grave in the cemetery. By the time the prison closed in 1937, after being moved to Reidsville, 162 convicts had been executed in the chair. The electric chair is now on display at the Reidsville facility. There are no markers with names in the prison cemetery. Those graves that are marked have only numbers on metal license plates. Edward Atkins, a former Hollywood producer and director, with credits such as "Clear and Present Danger" and "Teenage Mutant Ninja Turtles" is the great-grandson of Rev. E.C Atkins, the chaplain of Georgia State Prison farm from 1920 until 1936. During a documentary filming in May of this year at the former Georgia State Farm Prison, Atkins' film crew discovered large murals depicting scenes from the Bible painted on the walls of the dining hall by a French prisoner named Dr. Leon Pons. After more than 90 years of age and neglect, most of the murals have deteriorated so badly that it is impossible to identify the original subjects; except for a hidden mural of the Crucifixion. After all these years, the Crucifixion mural has "remained protected and bears witness to the hope of eternal life offered to the indigent and spiritually infirm. It endures to this day, hidden away on a dark wall in the prison’s dining hall." Take a look at some of the footage taken at the prison that captures the murals and Crucifix, provided by Edward Atkins, great-grandson of the Rev. E.C Atkins.